Are you curious about what the Catholic Church teaches? Want to explore becoming Catholic? Are you an adult Catholic, but need Confirmation and/or First Communion? 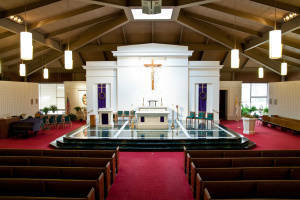 RCIA meets on Tuesdays from 7:00 – 8:30 p.m. in a classroom to the left of the altar from September to May. Come in the left side entrance of the church (nearest the rectory). We will answer your questions and help you discover what God’s will is for your life. Questions? Contact Kathy Schmitt, RCIA Director, at 301-325-3119. RCIA stands for the Rite of Christian Initiation of Adults. RCIA is the process through which a person joins the Catholic Church or completes his or her initiation into the Catholic Church. Initiation is the proper term for receiving the sacraments of baptism, reconciliation, first communion and confirmation. RCIA is for those who are not baptized, those who were baptized into another Christian denomination and wish to enter into full communion with the Catholic Church, and baptized Catholics who were not instructed in the Catholic faith and/or need to receive the sacraments of eucharist, confession and/or confirmation. Call ahead, or just come to the left-side entrance of the church on Tuesdays, from 7:00 – 8:30 p.m. The RCIA is a no-pressure, friendly, open process that will answer your questions and help you discover what God’s will is for your life. Questions? Contact Kathy Schmitt, RCIA Director, at 301-325-3119. What if I am already Catholic but need some sacraments?